BBC ON THIS DAY | 13 | 1985: Was Live Aid the best rock concert ever? 1985: Was Live Aid the best rock concert ever? Live Aid was billed as the biggest rock event the world would ever see. The 16-hour music marathon, organised by Boomtown Rats singer Bob Geldof, took place in two continents and was beamed live to 1.5 billion people worldwide. Dozens of the world's biggest rock stars took part in the concert and the event raised �30m to help the starving in Africa. I was in California and we recorded it on professional VHS decks, edited it down to like 4 hours. My girlfriend at the time was a professional dance-party producer, so we hired a big screen, put it in a dance hall and threw a fabulous dance party using the tapes as our programme. Except for direct costs, all the money raised went to charity - Geldof's African relief fund. 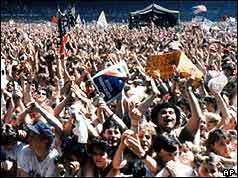 As a media event, Live Aid was completely unrivalled. As a charity, it was certainly the most successful. And as a concert, it was 'the big day' for many bands. My friend Debs and I had just arrived in London from Greece. We met up with a couple of Aussie friends who said they had spare tickets for a concert. No real details just that there was a chance a few bands would get together. The tickets were �25 which on our meagre Australian dollar backpacker funds we didn't think we could stretch to. We said no thanks. A couple of days later the tickets were still available so we threw caution, and the food and shelter budget, to the wind and bought the tickets. It's funny to think back now that we really didn't know just how big this thing was and we came so close to missing out! Queen were electrifying and who remembers when the sound failed on Paul McCartney and the only way 70,000 people could let the sound guys know was to boo! I remember the look on Paul's face - surely it would have been the first time EVER he was booed! Live Aid will never be repeated and I will always, always remember the sharing of food with complete strangers and singing and laughing along together. All day. Sensational! I had been to a party the night before and was feeling a little delicate that gloriously sunny morning on 13/7/1985. I kept telling my girlfriend that we had to get to a TV by midday or my life would be destroyed. We ended up at her Nan's flat when Status Quo kicked things off. After The Style Council her Mum arrived to take us back to her house out in the quiet countryside. I forget the whole running order that day, (I've yet to get the DVD), but my biggest disappointment was Adam Ant who, having had a string of notable hits earlier that decade, chose to sing his new single which not only was crap but also no-one knew it. His career ended that very afternoon. I can remember having a water fight with my girlfriend in the garden as we had been washing her Dad's car with the patio doors wide open and the TV on full blast. Queen were awesome - Spandau Ballet were okay - Dire Straits smoked - Bob Geldof sitting next to Ian Astbury and using the "F" word (which was brilliantly picked up on by the Spitting Image guys) - there were so many great moments that day. It's funny - now that it's exactly 20 years ago, everyone is talking about it, but I haven't stopped talking about it all during that time - and I wasn't even at the gig! Is it really TWENTY YEARS?!! It was one of the few days I ever planned to watch TV all day. Queen defintely provided the highlight, Freddie was the most diminutive figure on the stage but he had the world in the palm of his hand. I recall watching Princess Diana obviously enjoying the entire proceedings, while Prince Charles looked like a fish out of water. It was a particularly hot day and the first aid attendants were kept busy cutting off the legs from folks' jeans. Hosepipes were liberally sprayed around to keep the crowd cool. Sunburned arms were a common sight. Just as everyone was enjoying themseleves, "The African video" was broadcast to the tune of The Cars "Drive". This was a poignant moment that left many with tears in their eyes. As Concorde flew low directly over Wembley stadium at a pre-arranged time, a shiver ran up my spine as everyone cheered patriotically. When the ultimate showman, Freddie Mercury, performed Radio Gaga, I had another similar moment as I looked back to see virtually everyone in the stadium clap hands in the air in synch with the music. Freddie obviously delighted in holding the entire crowd in his hands. At this point, I turned to my pal Ray and said this would probably be the best day of our lives. We were actively involved in something of historical significance. I was absolutely correct. After the gig, the underground echoed to the continuous singing of "Do They Know It's Christmas". On the long motorway drive back up to Scotland I displayed the official T-shirt and programme in the rear window. Dozens of drivers sounded their horns in appreciation. I've stored the T-shirt carefully and have never even worn it. In 1985 my son Steven was born and was four months old when I watched the concert. We were at a barbecue. We had the TV on inside and people went in and out throughout the day. I watched the footage as my son lay on the baby mat - he was healthy, happy, wanted, and loved. I watched the footage of many mothers losing their children daily. My heart went out to them, it reached me in a very deep and meaningful way. We had little money but I sent off a cheque for more than we could afford, (in Western terms) but a week without priveleges was a small price to pay to support the cause. My cousin's husband, Mike Coneally (God rest him), and I arrived at Wembley at about 1000 and bunked the huge queues along Wembley Walk waiting to go into the stadium. Nobody said a word! We went onto the pitch which was covered in a tarpaulin and picked our spot. It was hilarious to see people laying out their blankets and cool-boxes for a picnic. It wasn't long before they had to shift! We had sneaked in some hooch disguised in two 2 x litre 7-UP bottles, so things were looking good. We picked our spot halfway between the sound box and the stage, and then stood there waiting. When Prince Charles and Princess Diana arrived to a fanfare, we were all impatient to get the show going. And boy what a show! Artist after artist playing their hearts out. George Michael stood at the back of the stage and belting out Elton John's Don't Let the Sun Go Down On Me was a favourite. More than any other artist, he rose to the occasion with a very difficult song to sing. The whole event was fantastic. Neither of us left the spot we picked for the whole event. When the show was over and we were being thrown out, our legs couldn't move, having been firmly rooted to the spot the whole day! I shall never ever forget that day. Fantastic. I still remember that day so vividly. Australia had its own concert, Oz for Africa, that started at 0800 on Saturday morning and I was glued to that TV till ALL of Live Aid finished at 1200 on Sunday afternoon. I shall treasure my tapes of the event as the DVD does not show certain parts. My only regret is I could not be there, but I would have loved to be part of music history. U2\Bryan Adams, Tina Turner and Mick Jagger were definite highlights. And Status Quo kicked the show off with the most appropriate song: Rockin' all over the World. Actually when the show had finished, I ended up watching it again, it was a event that gave me tears, laughter, and memories that I will cherish. Camping out outside the Apollo Theatre in Glasgow to get tickets . . . bumping into Billy Connolly at Euston on the way there . . . thinking that Madonna was truly awful . . . U2 so powerful and perfect . . . Amazement at being down at the front and seeing a real live Beatle right there . . . mesmerizing power of The Who . . . being charmed by Queen, a band I had never really rated . . . The crowd spontaneously bursting into "Singin' In the Rain" when the rain started near the end, and forgetting the words en masse after the second line . . . the camaraderie with complete strangers . . . the tender way the security guys passed around cups of water and sprayed the crowd during that hot afternoon . . .
Rushing back to a friend's London flat to catch the end of the Philly show and crashing out in a happy stupor long before the end . . . the feeling of being 18 and alive. Queen were the established super-group and delivered as expected, but I remember the buzz surrounding U2 during the build-up and then on the day itself. They were already successful but had been the 'Next Big Thing' of rock for a couple of years and everyone wanted to see if they could really handle that kind of stage. They were simply amazing on the day and Bono went to great lengths to reach out (sometimes literally) and make a connection with the audience. They kicked the concert into a higher gear and established themselves as the Biggest Band In The World for the next 20 years. Shame Bono's dancing with the crowd meant they had no time for the planned 'Pride in the Name of Love' finale! It was a great privilege to be there. I remember vividly two guys in front of us standing on the backs of their seats pretending to surf when the Beach Boys played. Queen were fantastic. Best concert ever. Freddie and Queen were classic. Still have the tickets/programme and photos. Yup - I was there. Lied atrociously to get the day off work (thank you Beverley for teaching my class !!) - but I think a jury would let me off..... wouldn't they? The day itself? Often imitated, never bettered (and never will be). Nuff said! "I was there" as my t-shirt soundly displays. It was �30 each for me and my best mate Malcolm for a return coach from Bridgend in South Wales and an entry ticket. Both the ticket and the "I was there" t-shirt are proudly displayed in my music room. It was, without any doubt, the best day of my life with the obvious exception of my wedding day with Clare. Malcolm and I spent the day drinking, laughing and guessing the first song each band would play. I have never been to such a good-natured concert or event. Even to this day we wind other friends up about not being there. It was and is the number one event of all time - never to be surpassed. My top five performers by a mile were Quo, U2, Queen, The Who and Macca. Glad I wasn't at the US end of things - poor. But I look forward to the next Live Aid and with a little luck I'll be there with my son Jamie and wife Clare. Keep on rockin' all over the world! I had been ill with the measles and the family doctor said I was too ill to go. That, of course, made not a blind bit of difference. I spent the whole day with my first love drinking and learning drunken Swedish from some students over from Stockholm. My highlight was when Billy Connolly was noticed way up in the Gods obviously drinking in the atmosphere. The whole of Wembley saw him and went berserk, waving and cheering. He was so flabbergasted he just blessed us all like the Pope! Classic stuff and a classic day! I just turned up with my flag, the biggest black and white U2 flag there and waved it all day long. Look out for me on the DVD! For me Geldof's "I Don't Like Mondays" summed it all up. From the moment we heard the piano intro we knew what was coming. You could feel the anticipation building even through the TV. It was numbingly electric. As Bob walked in a circle before the poignant verse you could see in his face this was the focus for him, and for us watching. Then the simplest of lines was delivered. "And the lesson today is how to die". Then silence, shock and realisation. That single moment, that few seconds of silence brought it home - and it hurt like hell. Live Aid changed my life. Truly the greatest show on Earth and I was lucky enough to be at Wembley. An unforgettable experience, with so many highlights - Quo kicking things off, seeing the crowd in Phili watch us in Wembley, the video of the Cars Drive, the idiots in the row behind us having a champagne lunch (we had a packet of stale ginger nuts) and of course the greatest names in music performing in front us. That day will never be topped. Not everyone was my cup of tea but everyone together for a good cause. Riff raff showing the establishment how to stop talking, get their finger out and DO something. Good for Geldof, et al. On the day? No question - Queen absolutely stole the show, but since Freddy Mercury was probably the greatest front man of all time, that's no surprise. I can remember a lot of tension. The whole world seemed to be holding its breath. Then I think Francis Rossi started the whole thing off with the greeting "Alright!". It was a fantastic ice-breaker, just perfect. The world breathed again. Between Queen and Dire Straits, I managed to get my "Hello World, Luv Graham & Lyn" banner on screen for all the world to see we were there. If anyone, anywhere should have a picture showing those big pink and red letters, I would like to hear from them - just to prove to our children their Mum and Dad were cool! I hate to spoil the party, but I remember the Live Aid concert as worthy but really terrible. Most of the acts were irrelevant and outdated even then, cynically trying to breathe life back into their careers (I was into The Smiths, New Order, Cocteau Twins at the time), and I had to go for a swim to avoid watching any more. Even David Bowie was embarrassing, though Lou Reed and Neil Young in the US were a slight relief. It didn't stop me donating to the cause though. I remember Live Aid well. I was ten years old and it was a hot July afternoon. U2 came on and Bono started singing an excerpt of Lou Reed's "Satellite of Love", which in my then limited knowledge of popular music I thought was a clever joke, aimed at the fact that the event was being beamed by satellite across the world! Everyone nowadays says that Queen stole the show but I must have been in the garden when they played because I can't remember them. It was a hot July afternoon. I was 15, and my folks were having a huge party at home. We were all helping out getting things ready, but I remember keeping a TV on in one of the rooms waiting for Led Zeppelin to play. As a teenager learning guitar, this was too mind blowing an event to miss. U2's performance was mesmerising. Truly a band on the verge of greatness. The concert sticks in my mind even today as one of the greatest charity organised events ever. The music laid on was incredible, and the legacy of what Bob Geldof achieved through that event set the tone for all other fund raising events. It enabled celebrities to utilise their status for the good of mankind. It was the first of a kind, and will never be surpassed. I had finished school and was enjoying the summer before starting work in the autumn. I remember not caring who else was going to Live Aid, but that I just wanted a ticket. The atmosphere both outside the stadium and then inside took my breath away. Everyone was so chilled but eager to party. The afternoon just got better and really kicked off when U2 came on. Being up front with a group who'd travelled from Ireland really made this a special moment. I remember Wembley singing along to Simple Minds in Philly and how Wembley actually sang louder when Jim Kerr asked. But being there to see The Who when the TV feed was lost meant we had had a private concert by one of the world's biggest bands. It is a great memory - one that is as fresh today as ever. It was a beautiful warm sunny day and the atmosphere was electric. We stood for hours in the sea of dancing spectators and gawped at seemingly endless stream of pop-stars and superstars. Queen put on an outstanding performance compared to most acts. I was seven years old and had the privilege of being taken to Live Aid by my parents. I remember Queen playing and my parents banging the plastic chairs with their feet to show how much they enjoyed it. Up until then my Mum didn't 't even like Queen! I clearly remember all of the adults around me crying at the finale when all of the stars got together on stage. It was so very moving because they were performing in front of pictures of starving children and they really believed that what they were doing would make a difference. Live Aid is something that I will never forget. I was privileged to attend Live Aid in July '85 and no concert since has come anywhere close - despite the numerous "tribute/appeal" concerts that have followed. The atmosphere was electric and the sense of "doing good" was all around. It was like having a party in your back garden with all your favourite stars playing for you and your mates. Strangers sang, joked, shared food and alcohol with each other and there was a real sense of community. It was fantastic to see so many legends on one stage and such a diverse range of genres played in one concert. There were two main memories that will live with me forever. The first was when Queen were singing Radio Ga Ga, no word of a lie EVERYONE was thrusting their fists into the air and singing along in time! The second was when we were ordered out of the stadium (no one wanted to leave) and the corridors were filled with everyone singing Do They Know It's Christmas? I have goose bumps just remembering that - really moving. Just an amazing concert all round. I was a student spending the summer in London studying theatre, and my then boyfriend (now husband) had come over with me. We were broke, and didn't have much money for entertainment. A friend said his father's friends could get tickets to this big sold-out concert. It was expensive, but so many of our favourite musicians of the time - Elvis Costello, Ultravox, U2, David Bowie, Elton John, and of course the Boomtown Rats - were on the bill, so we figured even if we blew our entertainment budget for the summer, it would be worth it. We had no idea we were about to be part of an historic event! As the show unfolded, it became clear that this was a unique event, that the best of the best had been gathered. The feeling was so good in the stadium - all of our neighbours kept chatting with us, and were very welcoming to we young Americans. Our favourite moment of the concert belonged to Elvis Costello. He came out alone on acoustic guitar, and stated that he was going to sing an old English folk song, and then led us all on a sing along of "All You Need is Love." I thought that was the greatest statement on a day that was about people taking real action to make a difference in the world. I was too young for Woodstock, but I was there at Live Aid '85 at Wembley! There are so many memories of the day itself, but one memory that lingers is that my girlfriend at the time (now my wife!) had queued for tickets but had to refuse an interview/photo with the local newspaper - one of the tickets was intended as a birthday present for a friend and it would have ruined the surprise! I have the programme, ticket stub and t-shirt to this day. But the best memory was seeing Bob Geldof outside puffing away on a cigarette looking totally exhausted. It was like a Mexican wave of cheering coaches as each one passed him. Fantastic memories! I was 13 years old, it was a really big deal - everyone was talking about it. I stayed up all night to watch my favourite band Duran Duran play (they weren't very good). David Bowie was great and I loved it when they all sang together at the end. I still have a copy of the video tape I made of the whole event. I might watch it later today. Biggest rock event? Very probably - it was unique because of the all the energy behind it - EVERYBODY was up for it and it worked! I and some friends were at Wembley (by the sound tent on the pitch) and remember it vividly - the incredible buzz and anticipation, the sunshine, the non-stop music, Concorde, the crowd, and "Teddy!" - and many other flying objects. I remember too the mad dash back at the end to catch the rest of the Philadelphia show. We never did see it all - we were finished! All happily exhausted! I arrived back in the UK on the morning of the concert after a disastrous holiday abroad. I was feeling somewhat sorry for myself. The whole family watched Live Aid for the rest of the day and everything came back into perspective. Even now, when I hear Drive by The Cars the emotions of the day come flooding back, a very moving day. What an experience Live Aid was. It all started weeks before when I queued up overnight at the Glasgow ticket point. Everyone was friendly because everyone was there for the same reason - to have a great day out and help others at the same time. The gig itself can never be fully described because this post would be too long to do it justice. The atmosphere and the camaraderie between everyone was astounding, the performers were amazing and the joy of seeing Smith & Jones introducing Queen was brilliant. If there are ever any plans to do an anniversary gig I have every intention of being there. Even if it means another overnight queuing session. 13 July 1985 was the day after I left school. My friend and I were flying out to Hamburg on holiday on that day. We sat at Heathrow and everyone had the radio on listening to Live Aid. I remember Status Quo coming on and everyone in the terminal dancing. When our flight finally took off, the pilot flew us over Wembley, banked so that everyone could see the crowds, circled and then flew off to Germany. What an amazing sight it was from several hundred feet up! The biggest single memory I have. Even now I can name the line up, songs sung etc. The acts were all of a high quality, and left marks on everyone in a different way. Who can forget U2, and Bono dancing with the member of the audience, or Queen's show-stealing performance? This was all down to one guy who felt strongly about the issue and wanted to do something about it. An example of what can be achieved if you really want to make a difference instead of classing images as "just another news story". I'm sure it could be replicated. Call me old, but I doubt the current so-called pop stars are of the same quality to pull off a 16-hour extravaganza. I was there. Wembley, that is, from beginning to end. Wonderful day. There were bands and acts that I thought I wouldn't be interested in seeing but I saw every act and all were fabulous on the day. Maybe a short set is best for some! Scorching heat, friendly crowd, wonderful finale. Where else, up to that point, could you see U2, Bowie, Elton John, George Michael, Paul McCartney, etc., on the same bill AND on stage together? Never, ever to be forgotten. Live Aid was fantastic. It was the first pop concert I had been to. I remember that everyone was so energised by being there, and there was such huge support for Bob Geldof and what he had done - he is still a hero of mine. I felt that the audience felt a real part of history and of working with the artists, not just listening to them. I remember it rained and some people wore black dustbin bags to keep dry, others didn't bother, nothing dampened our spirits. For me the main memories are seeing Paul Young who I was a fan of at the time. I also remember David Bowie who was superb, and Wham and Elton John and of course U2 who sent the crowd in the UK wild. I will never forget the electric feeling that went around the stadium when they arrived on stage. My recollection of Live Aid was my first ever time in London. I was there with my brother and two other friends. The weather was glorious sunshine and when we were sat outside the gates of Wembley waiting for them to be opened there were masses of people. Everyone was hyped up and happy. When we got into the stadium we got a drink and sat on the pitch sunning ourselves. The show began and it was complete hysteria from start to finish. My favourite bands had to be U2 and Queen. There was a rumour around the stadium that the Beatles were going to make an appearance with Julian Lennon standing in for his father - of course that never occurred but it will always be a day to remember in my life. When Status Quo came on singing Rocking All Over the World the place exploded! I remember Live Aid vividly. I was 17 and attended with my then girlfriend, her sisters and boyfriend. My first real trip to London. We arrived way too early and stood outside for a couple of hours waiting to get in. Once in, there was more waiting, but the atmosphere was already starting to build. When Status Quo came on singing Rocking All Over the World the place exploded! Best bits: Queen, The Who and the crowd; men's toilets full of women because the queues were so long; waiting in line to buy a program and watching the WPC, jacket open, dancing away. The one scene that will forever be etched on my memory is the moment when Drive by the Cars was played. The screens showed images from Africa, the starvation and despair suffered. I swear 72,000 people were silent apart from the odd gentle sniffing, as people cried. After the event we were on a massive high and were too tired to drive back to Wales. As one of our party had been a Nurse in Croydon we headed there, hoping to find somewhere to stay. We ended up on the floor of the Nurses' common room at Mayday Hospital. So, Nicola, Michele, Teresa and Mathew, my fellow Live Aid attendees I hope you too have the wonderful memories I do. Can't believe it's been 19 years. Can anyone remember the game of "throwing the teddy" going on whilst Madonna was singing? Wembley was so bored we (on the "pitch") were shouting for this teddy that was flying about to be thrown in our direction. There was Madge singing her little heart out and all we wanted was for teddy to be thrown to us! I remember standing in the crowd with my best friend Louise and thinking that we were part of history. I remember how hot it was and how excited we all were when it started to rain. People started throwing anything they could find up in the air (including Louise's espadrille - hey it was the eighties!). I remember going home and collapsing on the sofa and watching the concert from America and thinking I would never be part of something so wonderful again. I haven't. I attended the concert in Philly - only the second in my life and I've never been to another one that even came close. I have many vivid memories of the day, but what always stands out is the single most moving live performance I've ever seen - Teddy Pendergrass performed on stage for the first time after a car accident left him a paraplegic. He sang "Reach Out and Touch Somebody's Hand" along with Ashford and Simpson - it still gives me goose bumps. Everyone in the stadium was on their feet, swaying and holding hands. I worked in security at Wembley in July 1985, having moved to London two months previously. I had already worked quite a few concerts and other functions at Wembley, dealt with a few louts and troublemakers, but Live Aid was such a totally different scene! Everybody there was in the most wonderful of spirit, the place was electrified with good nature, kindness, niceness, humanity, things not seen enough on such a scale. There was a palpable sense of making a difference for the world, something unique, wonderful. Something I wouldn't have missed for anything, a wonderful experience, and an inspiration for the future, showing that ordinary people CAN make a difference, if folk will recognise it and take it. I was 18, working in a very popular town centre pub. What I recall is that the whole place just watched the TV and people were so happy at all the top bands playing, like Queen, U2, etc. But then the sadness and tears in peoples' eyes when they showed the poor starving kids. We collected a very large amount that day from everyone in the pub, and stayed open right till it ended very late the next day. One day in your life never to forget. Thank you Bob for making us stand up for once in our life! Although I now live in Seattle, I was at the Wembley concert and still have my T-shirt and a full video a friend recorded from the TV. As a fan of Queen I have to say they were the greatest but I was also particularly impressed with Status Quo, David Bowie, Elton John/George Michael and U2. The video of Ethiopia played to the Cars tune was a moment I will never forget as well as Phil Collins playing both gigs. I don't think I'll ever go to a concert as incredible as this one. I celebrated my 13th birthday by watching Live Aid. Completely astonishing my mother, I bounded at of bed at 6am to ensure the 8-hour time difference hadn't caused me to miss favourites such as Duran Duran, Paul Young, Alison Moyet, and Sade. It was such a great day, and I felt as if the world had put on a concert to celebrate my birthday! It was one of those occasions when I feel privileged to say "I was there!" The intensity of the emotion was unrepeatable, as act after act came on. There was such a feeling of togetherness. What sticks in my mind was when they screened the footage of the starving children in Africa to The Cars "Drive". It reminded everyone of what we were really there for - and tears flowed. It was so much more than just a rock concert. Bob Geldof is an inspiring individual to achieve what he did in such a selfless way. There were too many great moments to mention, but Queen was the definite highlight. Looking back from where I was standing, the entire stadium provided the handclaps for "Radio Ga-Ga" - quite a sight. Also Pete Townsend falling over, Sting coming on with Dire Straits singing "I want myyyy...", Let It Be, U2, the list goes on. Best concert there will ever be, and our generation's Woodstock. It was a beautiful hot sunny day. Me and my friends were playing cricket on the beach in Sussex with the radio on in the background. We all felt the excitement when Status Quo blasted out "Rockin' all over the world" to start it off. I remember some of us would run back to our houses to see a favourite band when they came on! It was a once in a lifetime experience, never to be forgotten and will live on in my memory forever. Live Aid was good. Elvis Costello was the King when he sang All you need is love. So simple, so genius. Elvis is King! That Saturday night myself and my music partner of the time Charlie Everton were booked to play at a hotel bar in Ogmore, near Bridgend in South Wales. We arrived to set up and the Live Aid broadcast was on in the bar with a fairly well-oiled crew totally absorbed in it. When it came time for us to start, no one wanted the TV turned off, ourselves included to be honest. The boss agreed. He still paid us, even apologised to us, and gave us free drinks all night. I was 13 on 13 July 1985 living Down Under. My mum would not let me stay up that late, 0200 hours local time. Now at 33, I've got the Live Aid dvd and it's fantastic, seeing Queen perform blew me away. Were you among the crowds in London or Philadelphia?